Last week, an [article] was published that talked about the biting ability of the extinct giant otter, Siamogale melilutra. 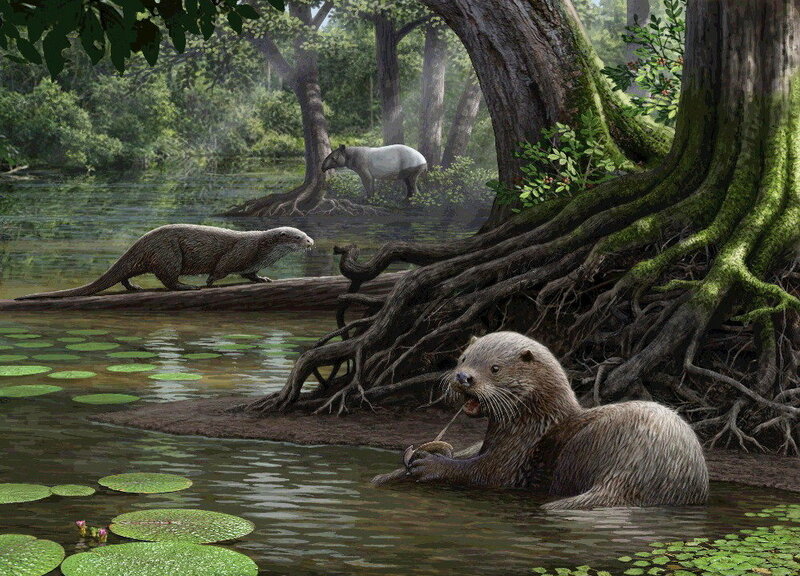 The [discovery] of this otter in south-western China was published in January of this year. It lived during the Miocene (23-5.3 million years ago). Siamogale weighed about 50 kg (110 pounds) and is the largest otter to have been found. A reconstruction of Siamogale by M. Antón. Living otters have a range of sizes from 4 kg (9 pounds) to 45 kg (100 pounds). They live all over the world in fresh and marine waters. And they’re really cute. 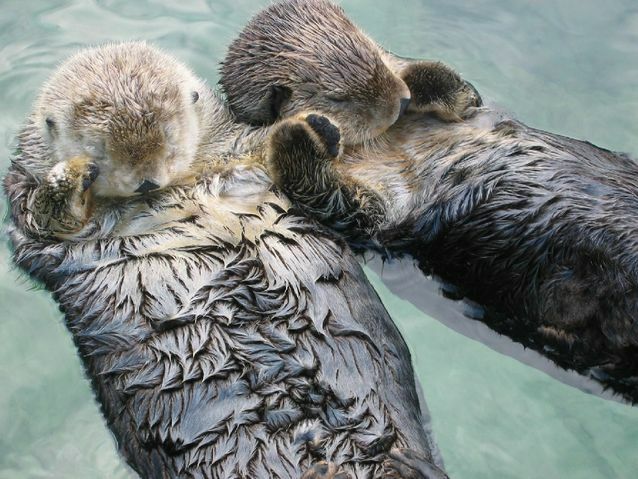 Otters holding hands. From Wikipedia. This new paper compared the jaw mechanics of all of the living otters. Jaw mechanics include things like how much force the jaw can handle, muscle volumes, jaw stiffness, and how efficient the jaw is when biting. The authors used the jaw mechanics information from the living species to calculate the mechanics of Siamogale. Then the authors made CT scans of all of the skulls and tested the mechanics using computer software. Figure 4 from the paper showing the computer models for the Giant River Otter and Siamogale. Red areas have higher stress, blue areas have less stress. They found that Siamogale had a jaw 6 times stiffer than any of the living otters! This means that Siamogale had a super powerful bite. It probably used this powerful bite to eat foods like clams that have to be cracked open to enjoy. Some of the living otters use tools to help them crack the shells. Other living otters use their powerful bite. Siamogale’s super powerful bite probably let them eat foods that other animals at the time couldn’t eat.